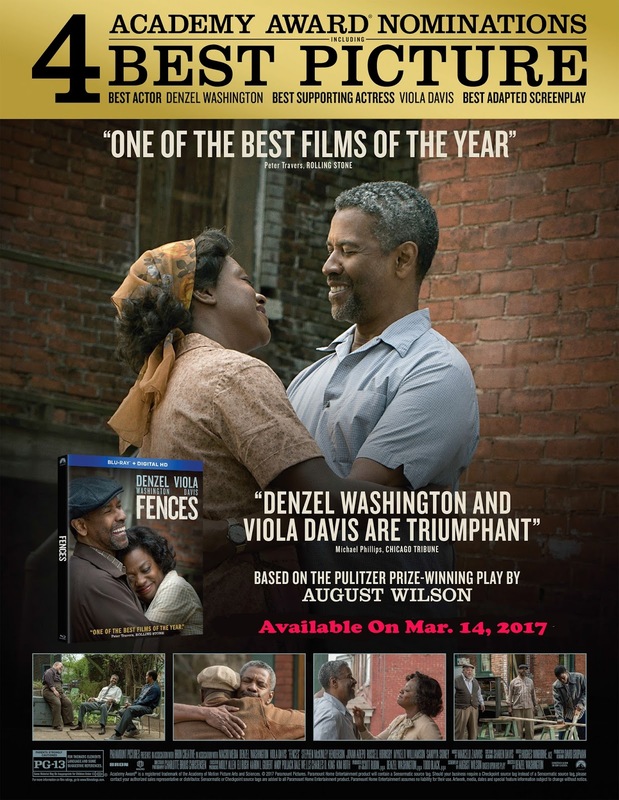 Paramount Home Media has placed Denzel Washington’s film adaptation of the 1987 August Wilson Pulitzer Prize-winning and Tony Award-winning stage play, Fences, on its home entertainment release calendar for delivery to retailers on Mar. 14. Both DVD and Blu-ray/DVD Combo Pack editions will be in the product mix. The ARR is a quick-to-market 88 days and domestic box office receipts currently total an impressive $53.9 million. Fences has been nominated Best Picture and Denzel Washington is up for Best Actor laurels (he has won in both the Best Actor — Training Day — and Best Supporting Actor — Glory — categories; plus four additional nominations during his career). Viola Davis is competing in the Best Supporting Actress category (this is her third nomination in that category — previous nods include The Help and Doubt) and in one of those Oscar quirks, August Wilson is nominated for his own screenplay (written before his death in 2005) in the Best Adapted Screenplay category. 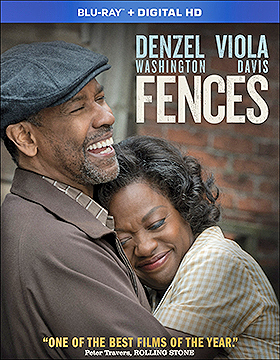 The film itself had a checkered path to final production, which included both Washington Not only is he, Denzel Washington, nominated for Best Actor, but he shares producer credit in the Best Picture category with Todd Black (his first Best Picture nomination … he’s a frequent collaborator with Washington — Antwone Fisher, The Great Debaters, The Equalizer and most-recently, the remake of The Magnificent Seven) and Scott Rudin (his eighth Best Picture nomination … he shared the win with the Coen Brothers for No Country for Old Men). and Davis winning Tony Awards for their 2010 revival of Wilson’s stage play. Also added to the release calendar this past week — for DVD delivery on Apr. 18 — is the massive, and we mean MASSIVE, 72-disc collection of Hawaii Five-O: The Complete Original Series (all 281 episodes), starring Jack Lord, James MacArthur and Kam Fong. You’ve done it, certainly as a kid, just to see if it were true. The lighting flashes and the count begins, “one hip-po-pot-amus, two hip-po-pot-amus … five hip-po-pot-amus” and then the thunder (wow, that was close, just one mile away). 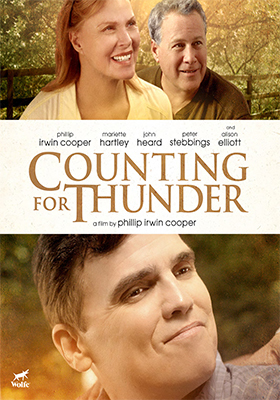 This counting exercise between the lightning and thunder serves as a wonderful metaphor for writer/director Phillip Irwin Cooper’s award-winning film, Counting for Thunder. First the lightning — that bright flash of light — as events in one’s life reach a crossroads, and then follows the anticipation of what comes next … the thunder! Wolfe announce this past week that Counting for Thunder will be making its DVD debut on May 2. This autobiographical tale introduces us to Phillip Stalworth (Cooper), a wannabe actor out in Hollywood, who is in a relationship that’s going nowhere — as is his career — when he gets some bad news from back home in Alabama. His mom (played by Mariette Hartley) has stage four cancer … he packs it in and heads home. There’s your lightning. Based on Cooper’s own experiences — a three-year stint back home in Alabama during this particular family emergency — brings a certain intimacy with the material. He speaks directly to you (the audience) in his narrative, which really doesn’t break the fourth wall, but it is close enough. You are with him in spirits and it works … you can’t help but take a liking to him as you join him on this life-altering journey back home. 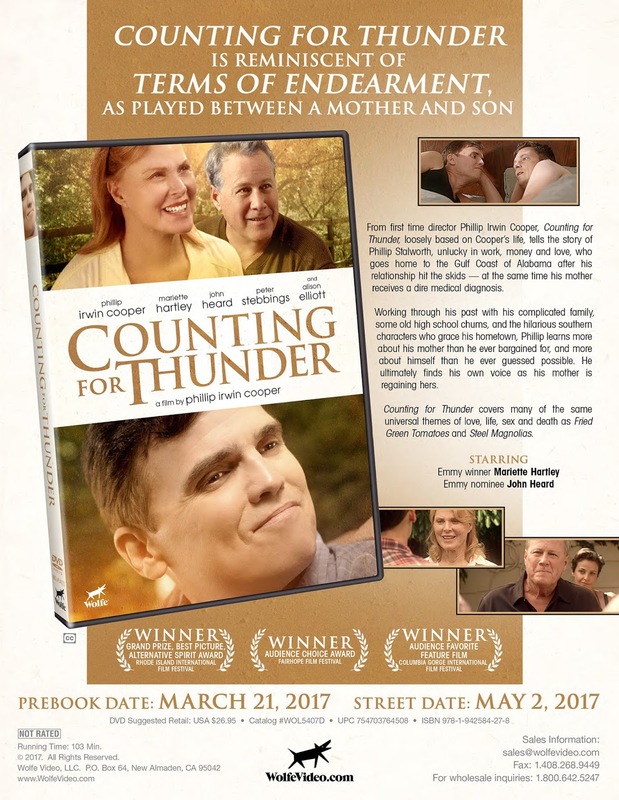 Not only is Counting for Thunder blessed with a marvelous script (real-life can be like), but the film boasts production values well-beyond its 2014 Kickstarter.com origins. In addition to Emmy-winner Mariette Hartley playing the role of his mother, Cooper also landed John Heard as his father, Alison Elliott (The Spitfire Grill, Birth and most recently in 20th Century Women) as his sister and Peter Stebbings (K-19: The Widowmaker, Re-Generation, and as Cardinal De Luca in The Borgias and as Alvin in The Listener television series) as an “old” acquaintance whose friendship brings more “thunder” to his life. Counting for Thunder is an excellent slice-of-life tale that is well-worth discovering come May 2. Icarus Films has wasted no time in rolling out the Distrib Films selections that it recently acquired for domestic home entertainment distribution. Last week it was director Jérôme Bonnell’s Just a Sigh, (starring Emmanuelle Devos and Gabriel Byrne), which will be making its DVD debut on Mar. 28. 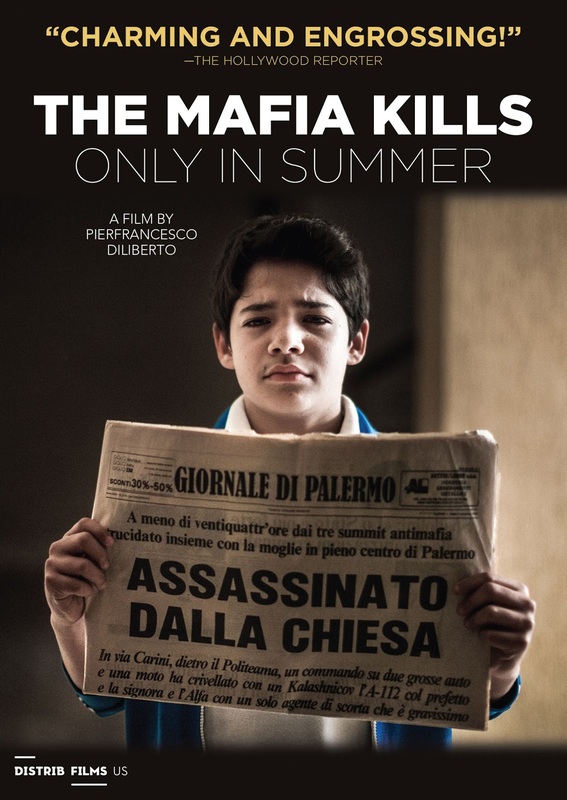 This week the good news is that Sicilian filmmaker and actor Pierfrancesco Diliberto (aka: Pif) will see his award-winning film, The Mafia Kills Only in Summer, available on DVD this coming Apr. 11. The film opened at the Torino Film Festival (it won the Audience Award) in November of 2013 and then proceeded to work the international festival circuit throughout 2014 and 2015, with a brief domestic arthouse theatrical run in March of 2015. And then gone. For the record, the ARR is 760 days and reported ticket sales were $37,134. With this distribution pack now in place, Distrib Films now has a partner in Icarus Films with the know-how to get films such as The Mafia Kills Only in Summer a second look in the home entertainment arena. We can expect more to follow. Diliberto, who is known to Italian audiences as the television satirist “Pif,” stars as the adult version of Arturo (the younger version is played by Alex Bisconti), a young man who was conceived on the very day that a Mafioso by the name of Totò Riina (Antonio Alveario) became mayor of his home town, Palermo. It is as if what followed was written in the stars — an intersection of souls. 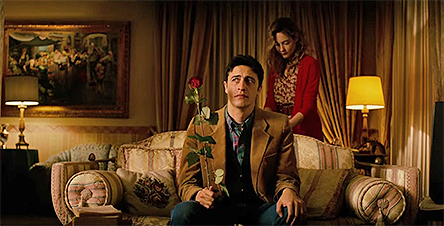 What filmmaker “Pif” has done is to give us a bittersweet history of 20 years of mob rule in this otherwise lovely Italian city on the island of Sicily in the form of a romantic (black) comedy that follows him and his life-long “girlfriend,” Flora (Cristiana Capotondi), from their days as school children to that of adults. Will they complete the cycle and marry or will Arturo let her slip away … or has destiny already written the outcome? 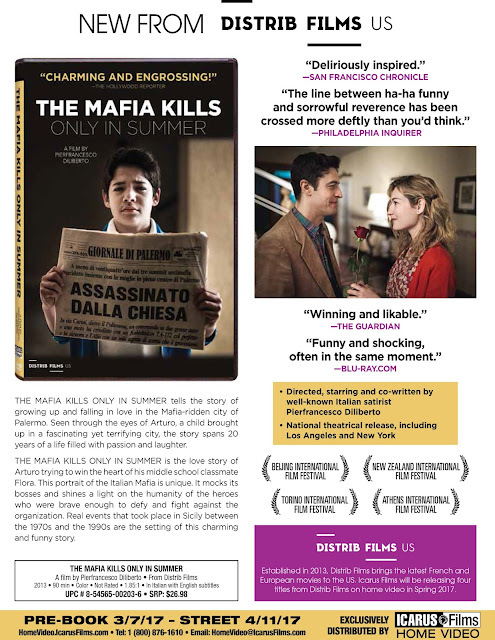 There is one other star of this film, and that is the city of Palermo itself (a sort of “Cliff Notes” history of the 1970s through 1990s plays out using actual footage and headlines covering important events in support of the film narrative). 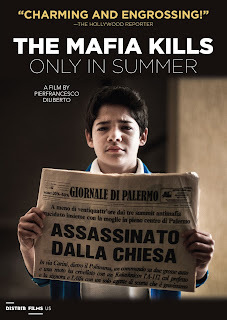 The Mafia Kills Only in Summer is presented in Italian with English subtitles. MIG Music (aka: Made in Germany Music), with domestic sales and distribution expertise provided by MVD Entertainment Group, has selected Friday, Mar. 10 as the street date for a trio of vintage Rockpalast concert presentations on DVD. 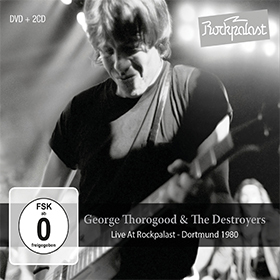 Kicking off the proceedings is the DVD/2 CD Combo Pack release of George Thorogood & The Destroyers: Live At Rockpalast - Dortmund 1980. This 15 song set was recorded live on Nov. 26 at the Westfalenhalle in Dortmund, Germany. The accompanying CDs feature audio versions of the same concert set. Next in the Mar. 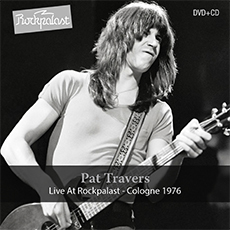 10 release mix from MIG Music is DVD/CD Combo Pack release of Pat Travers: Live At Rockpalast - Cologne 1976. The companion CD is an audio presentation of the same selections from the concert. Rounding out the trio of Mar. 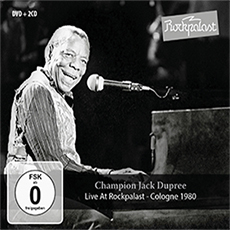 10 releases from MIG Music is the DVD/2 CD Combo Pack release of Champion Jack Dupree: Live At Rockpalast - Cologne 1980. This 17-song set was retrieved from the archives of WDR (Westdeutscher Rundfunk) and digitally remastered for this release. The accompanying CDs are an audio presentation of the DVD concert set. The Film Detective has selected Mar. 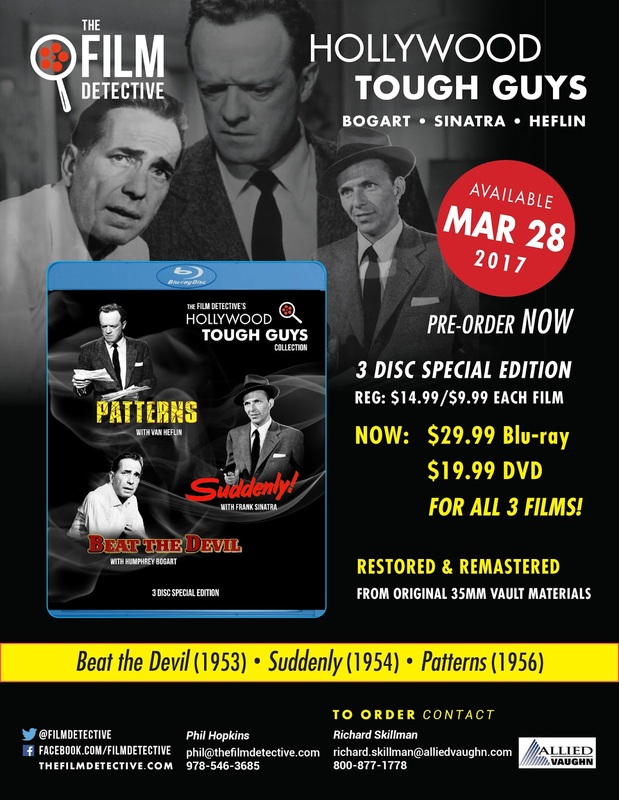 28 as the promotional release date for three-disc Blu-ray and DVD launch of the Hollywood Tough Guys Collection. If you held off buying their Blu-ray film restorations of Patterns, Suddenly! or Beat the Devil — for whatever reason — this will be the perfect time to bounce! This works out to a buy two-get-one-free promotion. 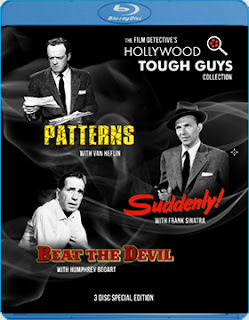 Included in the mix is director Fielder Cook’s 1956 film adaptation of Rod Serling’s teleplay-turned-theatrical release, Patterns, which has been restored from original 35mm film vault elements. Ed Begley, Everett Sloane and Elizabeth Wilson reprised their roles from the original Kraft Television Theatre presentation of Patterns, with Van Heflin taking over for Richard Kiley and Beatrice Straight, who plays Van Heflin’s wife, replacing June Dayton. Next we have director director Lewis Allen’s 1954 film noir political thriller, Suddenly!, starring Frank Sinatra, Sterling Hayden and Nancy Gates. This too is a restoration from the original 35mm film elements, and it is presented in its original theatrical aspect ratio of 1.75:1. Rounding out the group is the film restoration of director John Huston’s 1953 adventure/comedy, Beat the Devil, teaming Humphrey Bogart with the likes of Jennifer Jones, Gina Lollobrigida, Robert Morley and Peter Lorre. Warner Bros. Home Entertainment announced this past week that writer/director Edward Bernds’ 1956 sci-fi masterpiece, World Without End, starring Hugh Marlowe, Rod Taylor and Nancy Gates will be making its way to the Blu-ray market place on Mar. 28. 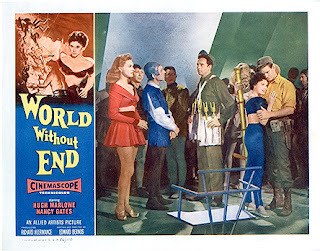 This Technicolor gem features Marlowe and Taylor, along with Nelson Leigh and Christopher Dark, as four astronauts on a return flight from a look-see at Mars. They are caught in a meteor swarm and their spacecraft accelerates to a speed that what we would come to know as “warp” speed (thank you, Star Trek) and is catapulted forward in time to the year 2058. They survive a harrowing crash-landing on an unknown planet, which they later discover to be their own planet Earth after an atomic Armageddon. Exploration leads them to encounters with giant spiders and Neanderthal-like mutants … and to a mysterious underground city populated by beautiful women, including Nancy Gates, Shirley Patterson (It! The Terror from Beyond Space) and Lisa Montell (She Gods of Shark Reef). The men are weaklings and it is just a matter of time before the mutants gain entrance and destroy the last vestiges of pre-war civilization! Also making their Blu-ray debuts during the month of March from Warner Bros. Home Entertainment are: Director Francis Ford Coppola’s 1968 film release of Finian's Rainbow (Mar. 7); writer/director Blake Edwards’ 1981 comedy S.O.B., teaming Julie Andrews with William Holden (also Mar. 7); director Donald Cammell’s 1977 film adaptation of the Dean R. Koontz novel, Demon Seed, starring Julie Christie (Mar. 14) and director James O'Connolly’s 1969 mixed-genre thriller, Valley of the Gwangi, produced by and with f/x by Ray Harryhausen (starring James Franciscus, Richard Carlson and Gila Golan). 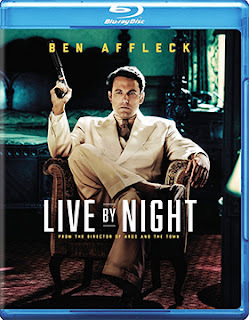 Warner Bros. Home Entertainment announced this past week that actor/director Ben Affleck’s film adaptation of Dennis Lehane’s “roaring twenties” crime novel, Live by Night, will be available on Mar. 21 as both DVD and Blu-ray product offerings. The ARR comes in at 88 days and domestic ticket sales from the film’s Oscar-qualifying theatrical run were a disappointing $10.3 million. The theatrical launch of Live by Night is yet another example of the old standby of the “platform” theatrical rollout is no longer working in today’s digital environment. The film opened Christmas day in just four theatres (Oscar qualifying), which signaled to critics that this was an important film. It played for two full weeks at this level and then on Jan. 13 jumped to just over 2,800 screens nationally. During that two week period the major metro film critics roasted the film and by the time it opened to a national audience word was out and no one cared. If you are going to open a big budget film — this is a gorgeous period film — it has to go wide, wide, wide on day one (at least 3,500 screens). Universal Pictures Home Entertainment announced this past week that they will be bringing home the bacon — that is, a four-SKU array of home entertainment product offerings — on Mar. 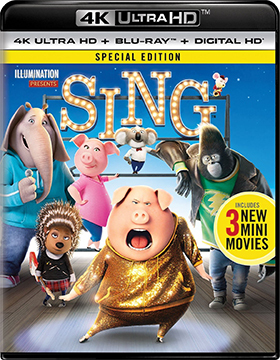 21 for the directing team of Christophe Lourdelet and Garth Jennings’ animated smash, Sing. The ARR comes in at a very-quick-to-market 88 days and ticket sales currently stand at a sizzling $265.4 million. 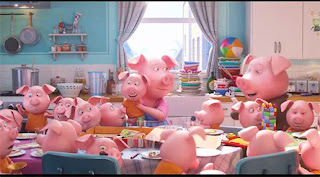 With that level of box office performance it was only natural that a sequel would be planned for release … expect Sing 2 during the Christmas season of 2020. 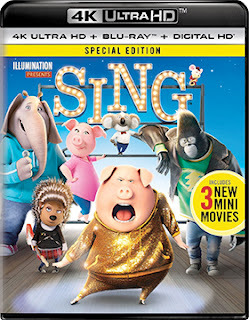 As to the home entertainment launch of Sing, Universal has planned a stand-alone DVD edition, a Blu-ray/DVD Combo Pack, a double-disc 3D/2D Blu-ray SKU and a 4K Ultra HD/Blu-ray Combo Pack. Also making the move to home entertainment is director Baran bo Odar’s Sleepless, starring Jamie Foxx as Vincent, a Las Vegas undercover cop, who has the night — and case — of his life when the focus of his attention turns to rescuing his son from certain death after he, Foxx, does something beyond stupid. DVD and Blu-ray/DVD Combo Pack editions will be available on Apr. 18. The ARR for Sleepless is 95 days and ticket sales from the film’s mid-January theatrical launch currently stand at $20.1 million. Anchor Bay Entertainment has tabbed Mar. 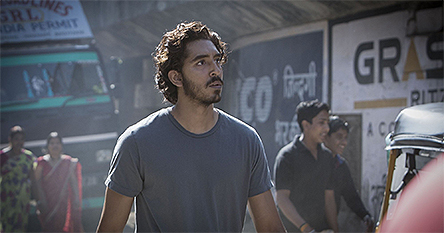 21 for the home entertainment launch of the Weinstein Company production of director Garth Davis’ film adaptation of Saroo Brierly’s 2013 biographical tale, “A Long Way Home,” which was retitled for the screen as simply Lion. Nominated for six Oscars, including Best Picture, Best Adapted Screenplay and two Supporting Actors nods — Dev Patel (his first) and Nicole Kidman (her fourth, she won Best Actress laurels for her performance in The Hours … Kidman was nominated Best Actress for her role as Satine in Moulin Rouge! 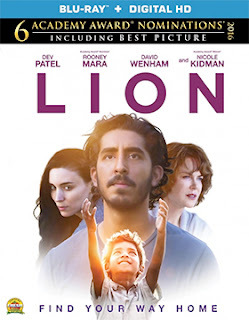 and for Best Supporting Actress in Rabbit Hole) — Lion will make its way home as DVD and Blu-ray/DVD Combo Pack product offerings. The ARR is 116 days and domestic ticket sales currently stand at $30.2 million. 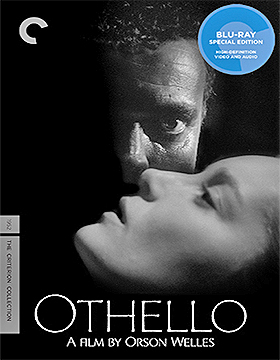 The Criterion Collection announced its May of 2017 DVD and Blu-ray releases this past week and you’d be hard pressed not to acknowledge auteur filmmaker Orson Welles’ 1952/1955 film adaptation of William Shakespeare’s Othello as being the prized jewel among the newly restored selections for release during the month. 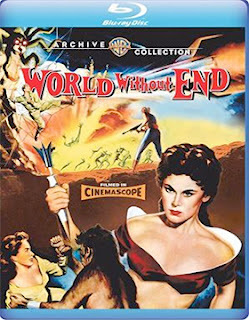 The film arrives on May 23 as a new 4K digital transfer and includes both the 1952 “European” cut of the film and the subsequent 1955 domestic theatrical cut on both DVD and Blu-ray as double-disc product offerings. 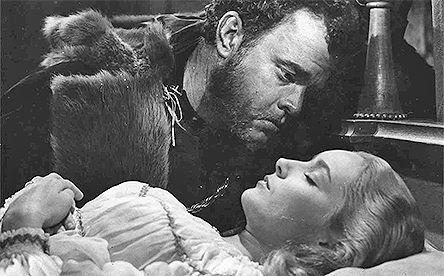 The story of the production of the film probably outshines the film itself, in that Welles literally had no production budget and thus it took from 1948 until 1951 to finally complete the start-and-stop-and-start again production. It had festival presentations at both Turin and Milan in November of 1951 and then went on to win the Palme d'Or at Cannes in May of the following year. It wasn’t until September of 1955 that a domestic distributor (United Artists) could be secured. Skip ahead to the early 1990s and the first attempt at restoring the film — including the fixing of sound and dubbing flaws — fell to Welles’ daughter, Beatrice Welles-Smith. She was able to locate the original negative and with the help of $1 million in restoration work a new result was obtained (the original restoration work alone cost many times that of the film itself … there’s a certain irony in that). Now we have Criterion’s 4K restoration of both versions, which includes a commentary track teaming fellow auteur filmmaker Peter Bogdanovich with Orson Welles scholar Myron Meisel (producer and co-director of the 1993 documentary It’s All True). Whew! That release is tough to top … what a gem! Other selections during the month of May from The Criterion Collection are: The late Chantal Akerman’s 1975 film release of Jeanne Dielman, 23, quai du Commerce, 1080 Bruxelles (May 9, DVD and Blu-ray editions); Japanese filmmaker Yasujirô Ozu’s 1959 film, Good Morning (May 16, on DVD and Blu-ray); writer/director Jacques Audiard’s 2015 Cannes Film Festival Palme d'Or-winner, Dheepan (May 23, DVD and Blu-ray) and director Terry Zwigoff’s 2001 Oscar nominee for Best Adapted Screenplay, Ghost World (May 30, DVD and Blu-ray selections). 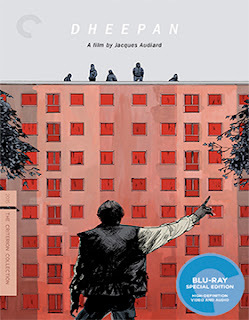 Lastly, May 30 is the street date for Martin Scorsese's World Cinema Project, Volume 2, a three Blu-ray/six DVD Combo Pack that showcases such arthouse film offerings as Limite (Portuguese), Revenge (Russian), Insiang (Tagalog), Mysterious Object at Noon (Thai), Law of the Border (Turkish) and Taipei Story (Taiwanese).